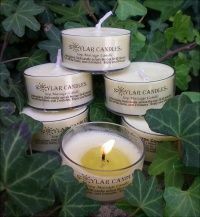 Handmade fresh soy massage lotion candles in 6 tealight cups. I chose the tealight cups because they don't get hot when handling them. Made with skin loving oils to pamper your skin. These are made with pure organic essential oils. If you would like unscented or fragrance oils, please visit our "Soy Candles" category. Each one lasts 2-3 back rubs.